Bright bedroom with natural light makes this room so relaxing. Furthermore, there some Mason jars that appear cohesive with tall plant on the corner. The unique lighting over the bed also adds aesthetic value for this bedroom decor. Deciding white color for bedroom allows the owner to decorate with many elements. 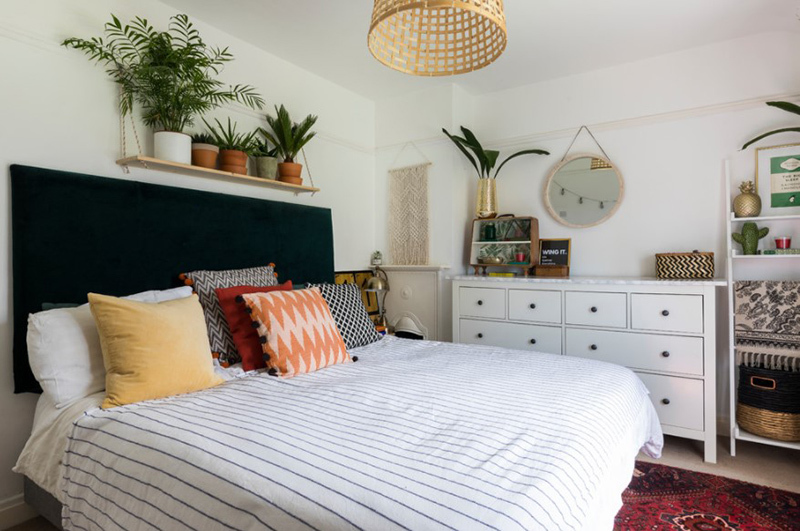 The idea of putting plants over the headboard makes this room looked fresh. The plants are hanged on a shelf made from wood board. The plant is placed beside a blue glass doors. There, you can see wardrobe and some books. This room is design to have more natural light. So, the plant can grow well with enough nutrition from direct sunlight every day. Here it is a bed room with low style ceiling. The role of plant besides bedroom is to add natural beauty. With white color tone the wallpaper will not make this bedroom appears too busy. Then, make sure to give enough lighting. Look at the chandeliers, navy chairs, blue and gray color room that remind us about beach atmosphere. A big plant besides the bed looks fresh and attractive. Further, you a pot of green plant on the table also complete this bedroom decoration. This bedroom is designed for relaxing your mind. Look at the wooden accent wall that appears natural that cohesive with wooden floor. Moreover, golden canopy bench also works well with printed bench. Then, tall green plant shows its power beside glass window. See this Japanese bedroom appeal with primary wooden material. The plant on the side comes to add natural touch for this room decoration. This place is perfect to get relax and rest. A bedroom that opens up to an outdoor area makes this room looks natural and calm. Even you get more fresh air. Bring green plants inside and more green plants outside will keep you healthy.